But 63,000 Northern Ireland homes and offices – or 8% of properties – remain unable to sign up for broadband speeds over 10 Mbit/s, the speed required to meet a typical household’s digital needs. This is down from 107,000, or 14%, last year. The findings are part of Ofcom’s Connected Nations 2016 Northern Ireland report – an in-depth look at the state of the Northern Ireland’s telecoms and wireless networks. This year’s report shows good progress on the availability and take-up of communications services, which are crucial to people’s personal and working lives. However, the report finds there is more to do – particularly in boosting mobile and broadband coverage, and improving the quality of service provided by telecoms companies. For example, rural areas still lag behind on broadband. Around a quarter of properties (59,000) in rural Northern Ireland cannot receive a connection of over 10 Mbit/s, often because they are situated a long way from the telephone exchange or local street cabinet. 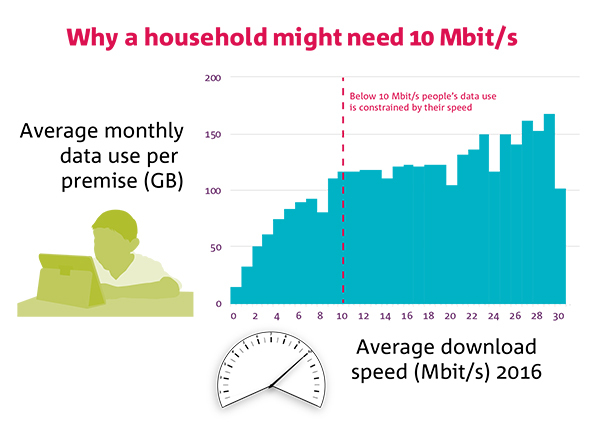 To help close this speed gap, Ofcom has today set out its technical advice for the Government on implementing its plans, announced in 2015, for universal broadband. Jonathan Rose, Ofcom Northern Ireland Director, said: “Mobile and broadband coverage continued to grow this year, but too many people and businesses are still struggling for a good service. We think that is unacceptable. The average download speed of a broadband service in Northern Ireland jumped by 21% in the last year, from 28 Mbit/s to 34 Mbit/s. This reflects not only better coverage, but also people choosing to pay for faster broadband packages. Around a third of Northern Ireland homes (34%, or 254,000) have now chosen to take up superfast broadband – a download speed of 30 Mbit/s or more – up from 29% a year earlier. Superfast broadband is now available to eight in ten Northern Ireland homes (83%), up from 77% last year. This has been driven by BT upgrading its network and on-going investment by the Northern Ireland Executive. Superfast services are now available to 71% of small and medium sized enterprises or SMEs – up from 66% in 2015. Mobile coverage has also improved in the last year. Six in ten premises (64%) can now receive an indoor 4G signal from all networks, up from just 37% last year, as operators continue to roll out faster mobile broadband. Ofcom rules mean that O2 must deliver a mobile data service to 95% of premises in Northern Ireland by the end of next year, and other operators are expected to follow in order to remain competitive.